Inside: Do you rack up a lot of credit card debt each December? 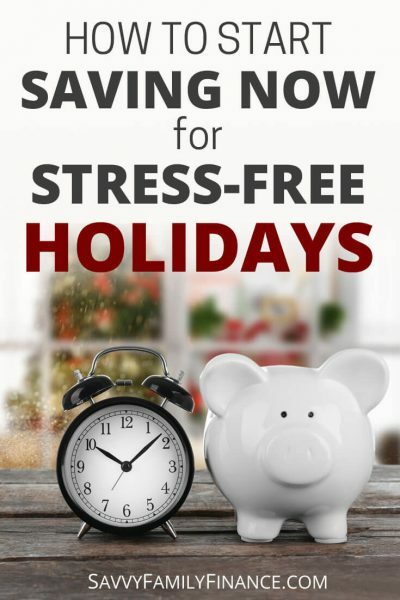 Find out how you can start saving for the holidays now and avoid overspending this holiday season. It’s beginning to look a lot like…summer here. We are actually in the midst of a heat wave and extended dry spell. And yet! It is the perfect time to take a look ahead at the calendar and start saving for the holidays. In fact, it could be January or February and the advice would still hold true. No matter the holidays you celebrate, chances are you spend more money on food, gifts, travel, and celebrations in December than any other time of the year. All that celebrating tends to blow budgets and can drive people deeper into debt. Your best bet to stay in the black while enjoying the festivities is to plan ahead and start budgeting for Christmas, Hanukkah, Kwanzaa, that office party dress, or that big dinner you always serve. There are a few strategies to help you save for the holidays and avoid holiday debt. This may seem tricky, but it is important to sit down and determine, to the best of your ability, what you will spend this coming December above and beyond the normal expenses. When creating your holiday budget, first add up all your anticipated costs. If you also give tips, give presents to coworkers or teachers, be sure to include those in your budget as well. How does your list look? Well, in this case, if you start saving in August, that gives you four months of savings before December. This means you need to tuck away $238.75 each month ($955 / 4). If you decide to start in February, then you would have 10 months of savings at $95.50 each month for your extra holiday spending. Why are you going through all this work? Let’s say the above amount, $955 is what you normally spend for the holidays. But this year, you’ve been paying down debt, tightening belts and want to stay out of debt. That is great! But to do so, you may realize spending almost an extra $1000 during the holidays won’t work. Now is the time to figure out what you will do. Many banks now allow you to create sub-accounts for different purposes. You can often even give them a nickname such as “Holiday Savings” so when you look at your statement, it is easy to figure out the purpose of the money in that account. Once you set up the account, set up an automatic monthly transfer of money from your checking to the savings sub-account. If you worry about money being a bit tight, set a reminder in your calendar to manually transfer funds. Either way, create a way to make the savings a habit. Do you work on some side-hustles to bring in extra money? Do you lower your gift-giving budget? Maybe you decide to only exchange handmade gifts to save money (though, calculate the cost of supplies so you aren’t surprised!). Maybe you forgo the Christmas tree and just set out other decorations for a holiday feel. Use a side-hustle to earn a bit of extra spending money for the holiday season or even check the balances on your rebate apps and see if some money there is ready for withdrawal. We even keep a change jar and bring that to a local Coinstar machine each fall to exchange for gift certificates. Another option is to get a seasonal job that will bring in a good amount of money to cover your end of year spending. Another way to find money for your holiday fund is to make room in your budget by cutting expenses elsewhere. Maybe you knocked it out of the park in grocery savings for the month. (Good job!) The money in the grocery budget you didn’t spend can go into the gift fund. If you manage to cut cable or even reduce your wireless bill, the savings there alone could pay for your celebrations! You can also cut expenses by reducing the cost (or number) of your gifts. If you have children or relatives that are used to a certain number or level of gifts, let them know early about your change in plans in order to avoid bad feelings. You have taken a few minutes to figure out your expenses for the holidays, automated your savings or have a plan of action. The early start you have on saving for the holidays gives you breathing room so you can relax and enjoy all the fun without the stress of wondering how you will pay for it all. How do you pay for the holiday season? Great ideas! I always start shopping for the holidays around now, but haven’t been good about keeping a budget. Shopping sales early is a great idea!